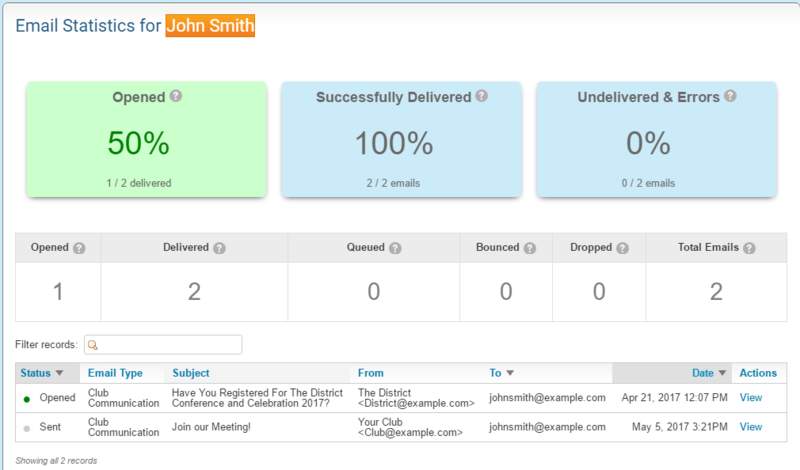 Tracking and viewing emails sent to you through ClubRunner is now easier than ever. With the My Email History page under the My ClubRunner tab in your Member Area you can see a list of all ClubRunner emails sent to your inbox, view the delivery statistics, and even open the email itself to see its contents. 1. To access your email history in ClubRunner, login to your Member Area and click on the My ClubRunner tab. 2. Next, select the My Email History tab below. 3. On this page, you can view email delivery stats as well as the number of emails that you have opened, and any undelivered or otherwise erroneous emails. 4. By Clicking on the View icon under Actions for any of the emails, you can see the content of the email directly on your Web Browser. Sent - The email was sent to the recipient. The email could have been opened, but not reported as opened due to anti virus blocking the notice of it being opened. Opened - The email was opened. This could be false, the anti virus could have opened it to check the email and the recipient never opened it. Or the anti virus or email client could have blocked the message coming back to us saying the email was opened. To learn more about email tracking please read the article about email tracking. Dropped - The email was not sent because the email is on the blocked list. Bounced - The email was not received because an error was returned by their email service. Eg. email address does not exist. Blocked - The email was not received because their email service blocked the email. Spam - The recipient reported this as spam. They will no longer receive future emails sent from ClubRunner. Unknown - The recipient was sent the email, but the system does not know if the recipient received it or not. How do I view my email stats? Where Can I Email in ClubRunner? How do I access the email traffic report?